We are told in the movie, Kimi no Na Wa, that kataware-doki means twilight in the dialect of Hida, where Mitsuha lives. 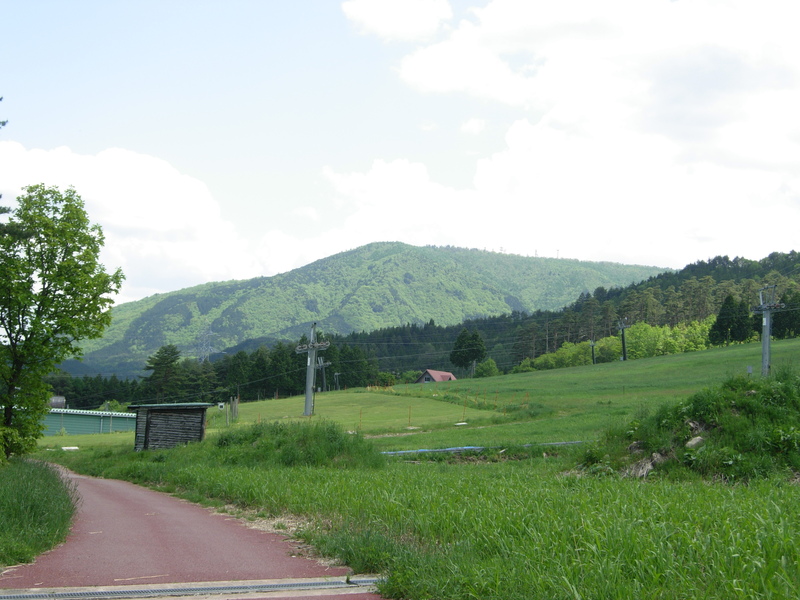 Iwakage has more about the land of Hida as seen in the movie, if you click here. Strange things can happen during kataware-doki, the toki time of kataware. And they do, in the movie. Kataware means a fragment. Fragment of time. Also, the fragment of the meteor that crashes to earth in Hida, obliterating Mitsuha’s hometown. Let’s consider the fragment of time called kataware-doki. Twilight is a fascinating time of day — or is it night? It is the time between day and night, when it is neither day nor is it night. It is kure, dusk. Many haiku have been written about kure. Here’s one by Basho. kono michi ya / yuku hito nashi ni / aki no kure. This lonely path that Basho describes could be a viewed as an autumn day turning into night, or as late autumn when the season turns to winter. It may even allude to the time when his life is coming to a close. Kure is a border between two things such as light and dark, life and death, between two instants of time. It is at such a border that all things are possible. As we were pondering twilight, Earth and Sky posted an article on three definitions of twilight, saying “You can define twilight simply as the time of day between daylight and darkness, whether that’s after sunset, or before sunrise.” They explain how Civil, Nautical, and Astronomical Twilight are defined — astronomically. Still, these definitions do not explain how we feel about twilight. Perhaps that was question being posed by Makoto Shinkai. This entry was posted in astronomy, Consciousness, Haiku, Hida and tagged autumn, twilight, who? on 2017/06/08 by Okunomichi. Kimi no Na Wa is an extremely popular and powerful anime movie directed by Makoto Shinkai. We say “powerful” in that it is thought-provoking of matters outside the ordinary limits of time and space. Musubi. Kumihimo is a Japanese braiding method for making decorative and functional cords, and it is depicted in several scenes in the movie. Musubi is a knot, a tying together, of connecting people and things. The photo shows two kumihimo cords in a musubi knot. Time and Space. 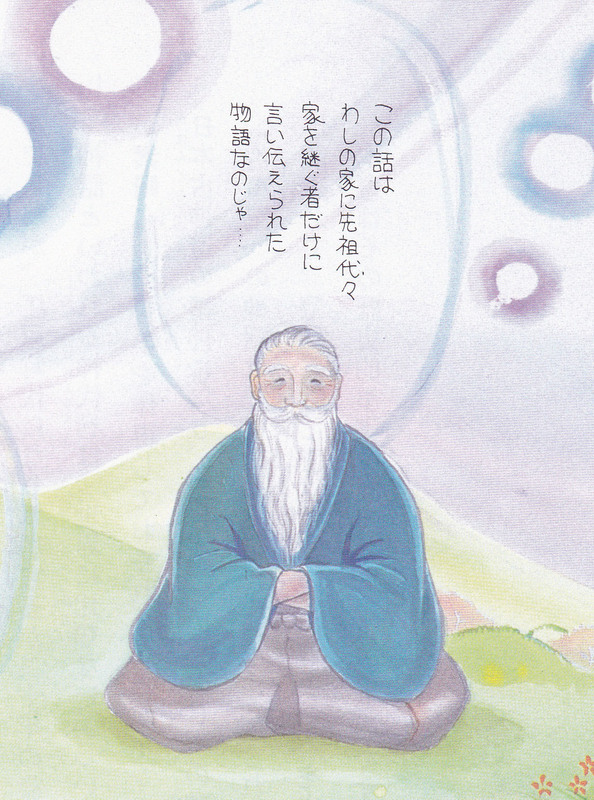 We have related the Tanabata Festival tale as the weaving of time and space. This is an observance since early Jomon times that takes place in the seventh night of the seventh lunar month, when the moon is only half-full and the stars in the Milky Way can clearly be seen. The word tanabata means a kind of weaving loom. So picture a fabric being woven with threads of warp and woof. The threads of the warp represent the flow of time, and the shuttling of the woof creates space. Kimi no Na wa (君の名は) is an international hit movie, entitled Your Name in English. The warping and entangling of time and space is the theme of this metaphysical movie. Perhaps that’s why millions of people find the movie so intriguing. In today’s essay, we consider how the movie conveys the message of Musubi through the imagery of braiding. Early on in the movie, we see that Mitsuha lives with her sister and grandmother in a very small town in the rural land of Hida. Grandmother is priestess of an old shrine which has as its goshintai sacred object a megalith in the center of a meteor crater. Mitsuha serves as miko-san shrine maiden and performs a ritual at the shrine. Grandmother is also teaching Mitsuha to braid cords in the style of kumihimo. What, we wonder, is the significance of these elements? Grandmother’s explanation of Musubi uses the imagery of kumihimo. In one scene, Mitsuha and her sister are going with their grandmother on a pilgrimage to the sacred place of the megalith. On the way, Grandmother is explaining Musubi. We have restored the original word, kami, to the subtitles. Musubi is the old way of calling the local guardian kami. Tying thread is Musubi. Connecting people is Musubi. These are all the kami’s power. So the braided cords that we make are the kami’s art and represent the flow of time itself. They converge and take shape. They twist, tangle, sometimes unravel, break, then connect again. From the above, we can see that the concept of musubi is that of gathering and connecting. Grandmother has explained how people are connected in time and space, and she stresses the time element. This is the basic theme of the movie. This entry was posted in Cosmology, Hida, Hotsuma, Kami, Philosophy, Worldview, Woshite and tagged Festivals, Kimi no Na wa on 2017/06/08 by Okunomichi. Once upon a time: A golden rooster lived in Kyoto during the Heian period. It crowed every New Year’s Day during the four centuries of peace. Then, in the year 1093, war broke out and the golden rooster flew away. The Princess Kogane-Hime, a devout Buddhist who missed the rooster, faced Hiei-zan. She heard a message: Go to a mountain of waterfalls. So she traveled far and long and finally reached Hida-Kanayama at the end of the year. She could hear the voice of the rooster, but search as she did, she could not see it. She went from one waterfall to another: The Shirataki and the Ni-no-taki, and finally a third waterfall. She stood under the water to purify herself. Suddenly, she heard the golden rooster. 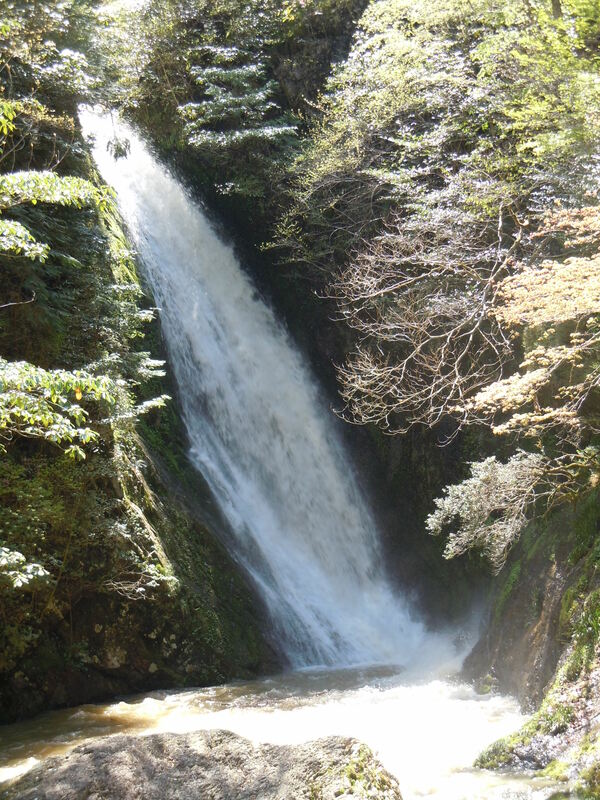 The falls she stood under became known as Keimei-taki of Yokotani Gorge. Although the rooster refused to return to Kyoto, Kogane-Hime gathered some herbs for her ailing mother and went back to Kyoto in time to save her mother. The princess became known for her compassion and was regarded as the goddess of children. People would come to Komori Jinja near Keimei Falls to pray to the great Komori goddess when their children became ill. After the children recovered their health, in gratitude, they brought rooster images to Komori Jinja. The day before the summer solstice 2012, we visited the White Waterfall (Shira Taki) and the Double Waterfall (Ni no Taki). Due to the rain, we had to by-pass Keimei Taki. In 2013, we were able to go to Keimei Falls. 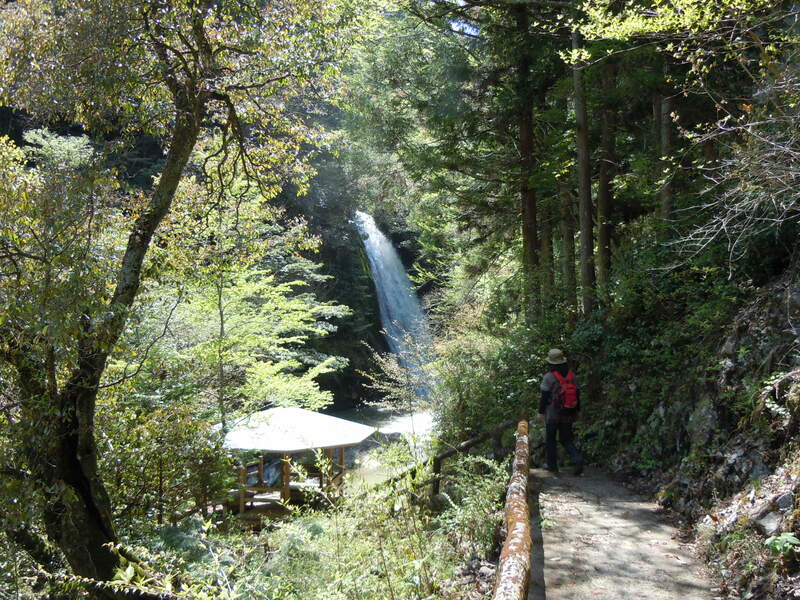 There is a hokura at the top of the path down to the pool where the taki falls. It is a beautiful waterfall. There is a lot of water coming down, so it must have been quite a feat for the princess to stand under it. 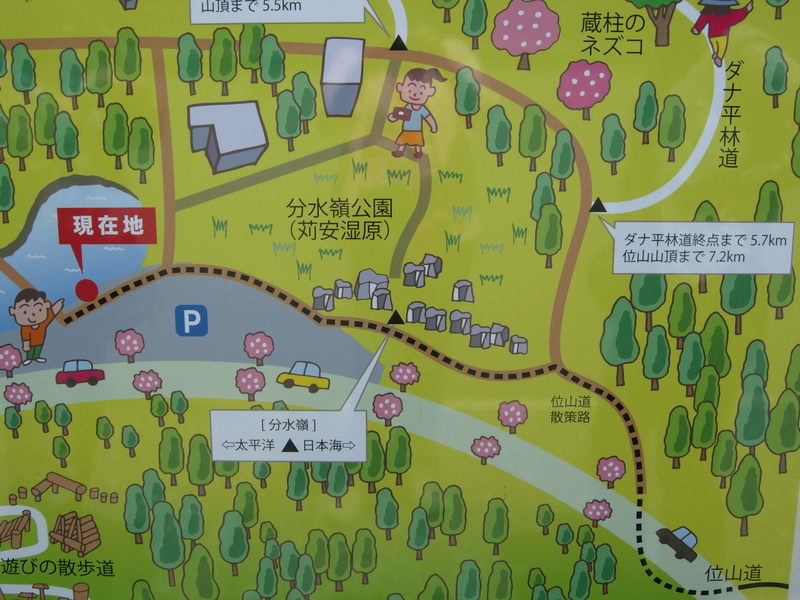 There is a small pavilion where we had a bento lunch surrounded by verdant sugi and hinoki trees. Other than the structure and the path, the rest is as nature had it a thousand years ago when the princess stood under the falls. 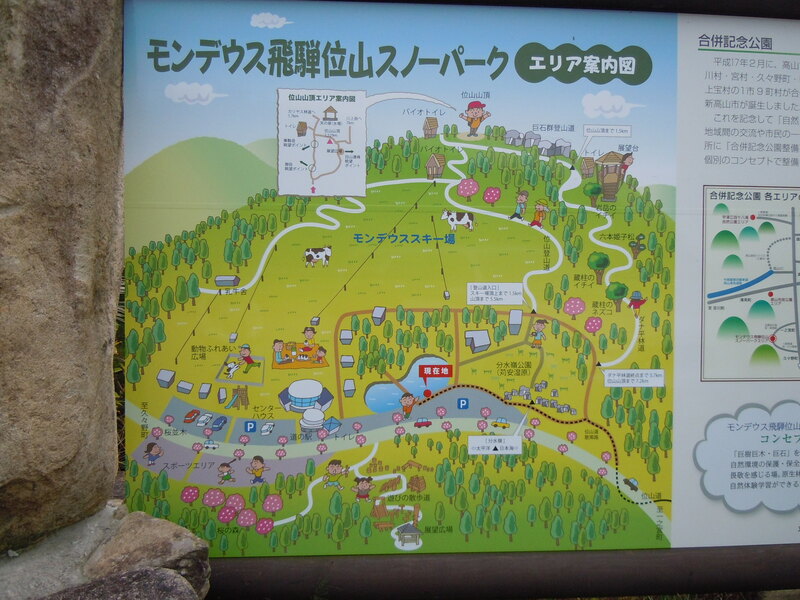 This entry was posted in Hida, Mountains and tagged waterfalls on 2013/06/29 by Okunomichi. Takamagahara, the mythical Plain of High Heaven, is not in outer space or Heaven, but it is here on earth; not on the Asian continent but in Nihon. 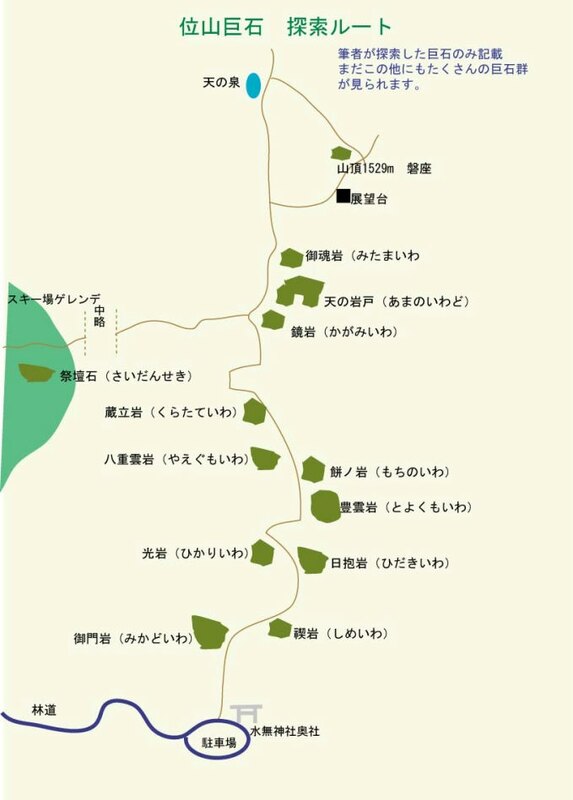 There are iseki ruins which indicate that Takamagahara is right here in Hida. 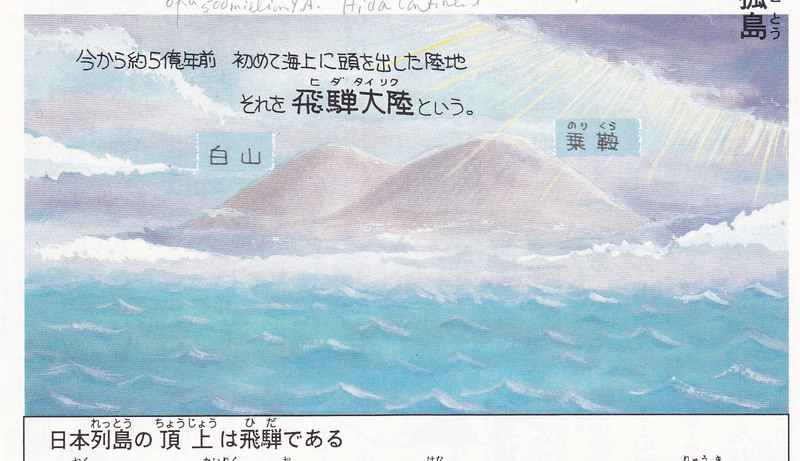 Because Hida’s tall mountains saved the people. A third cold wave occurred with a great deal of snow in Hida. There was a meeting of the leaders of the land to consider moving to a more southerly and warmer climate. The family of the Sumera Mikoto spread out to different areas. Amatsu Hikone no Mikoto went to the area we know as Hikone in Omi (Shiga-ken), where he established Taga Taisha. Izanagi and Izanami went to Mie-ken, and that is where Izanagi died. Ninigi no Mikoto went to Tsukushi (Kyushu); Nigihayahi went to Kawachi province (now Osaka). Both had Tokusa no Jingi so that their descendants would know that they were related. The Jingi included the feathered arrow, Ame no Habaya; and Ame no Kahiyuki footwear. Hirume/Amaterasu had a dream that there were three streams of invaders on Tsukushi. Because her dreams were highly regarded by the people, it was decided to first send three princesses and check it out. After eight years the princesses returned with confirmation. 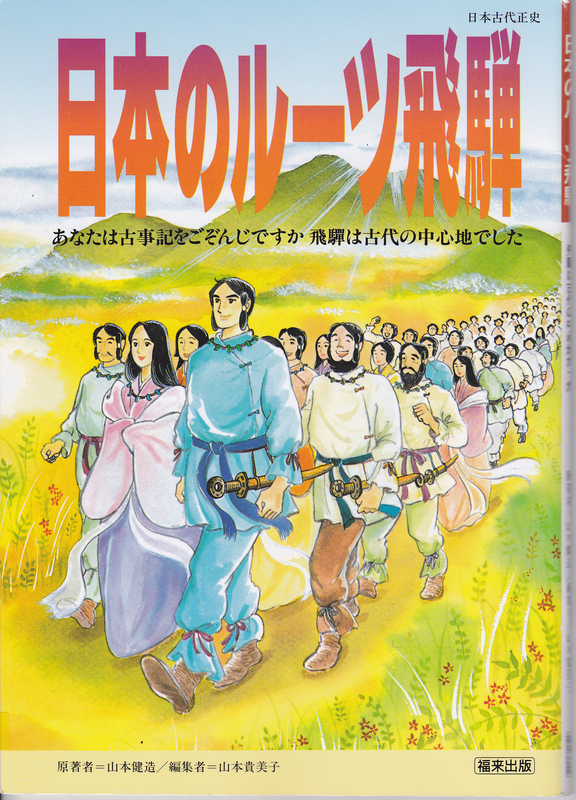 So Ninigi was sent with a large group of young couples from Hida to settle and develop the land in Tsukushi. A descendant of Ninigi, Sanu no Mikoto (his childhood name) became Takehito/Iwawarehiko and is posthumously known as emperor Jimmu. He, too, received the kurai-ita upon his enthronement. Jimmu’s two brothers remained in Tsukushi. Queen Himiko of Tsukushi was a descendant of the younger of Jimmu’s brother Mikinuma no Mikoto, 239-266 CE. She sent a messenger to Gi (China) and is mentioned in the Gishi Wajinden. 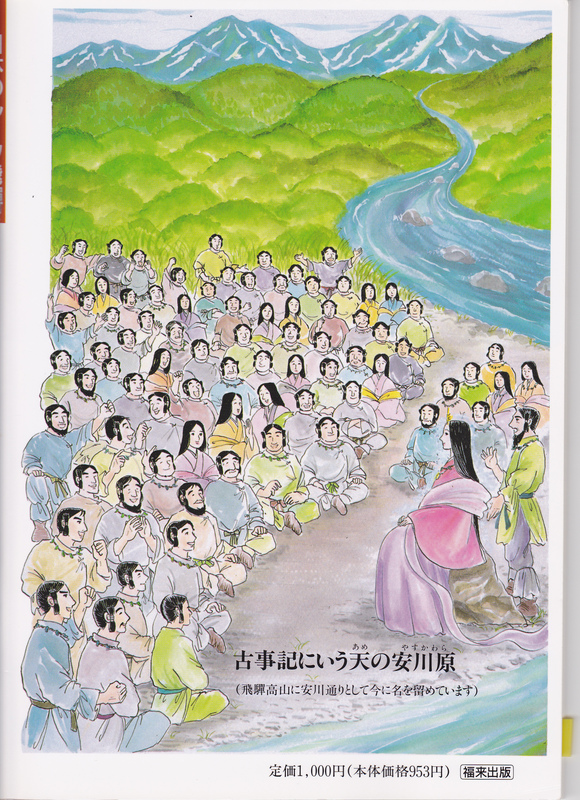 The Gishi mis-spelled her land ‘Yamato’ as ‘Yamatai’, and that is how Yamatai entered the history of Japan. The ancient people of Nihon surely faced difficulties and hard work during their long history. Yet, the philosophy they practiced entailed living compassionately and contentedly without complaining and always looking to a bright future. Can we learn a lesson from these people? This entry was posted in Ancient civilization, Hida, Hotsuma, Jomon, Takenouchi and tagged Arahabaki, Tsukushi on 2013/06/29 by Okunomichi. 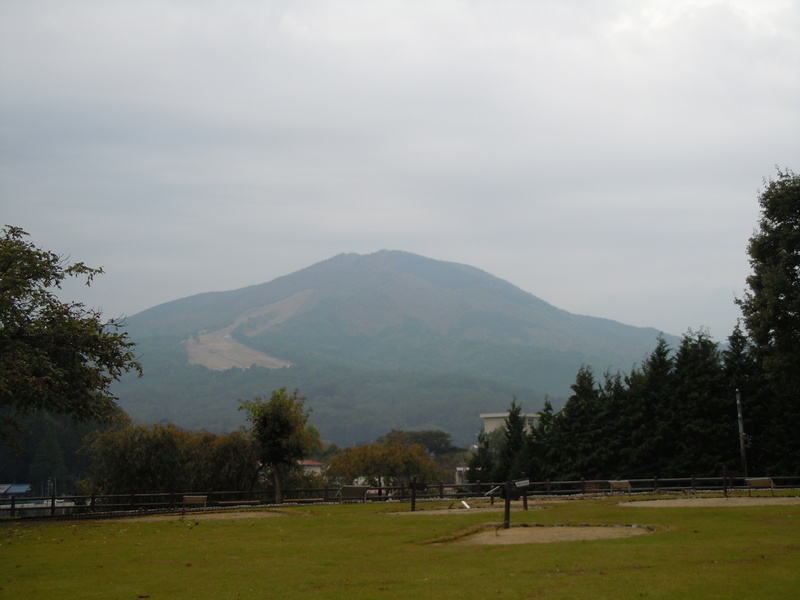 Kuraiyama, 36 degrees N, 1529 m, is said to be a pyramid mountain. Moreover, it is claimed by the Takenouchi Documents as the site where extra-terrestrial ancestors touched down. Its name, crown, refers to its regal status in prehistoric annals. More exactly, ‘kurai’ means ranking, and this is the number one ranking. The ichi-i (again, number one) tree grows here. From the wood is made the mace of the emperor. 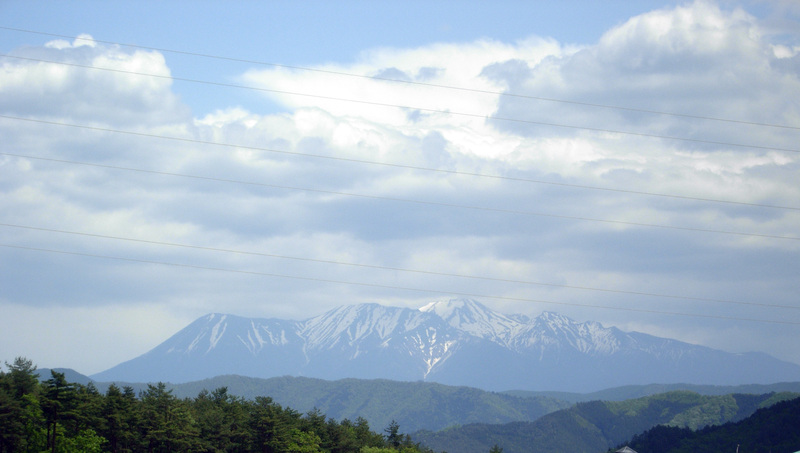 Kuraiyama has been rudely treated by being partially denuded to accommodate a ski resort. However, it is said to still have a number of interesting megaliths on top. Click on the map to see it enlarged. Eerie stories have circulated about mysterious lights and even more mysterious strangers. Here’s more about the megaliths. Megaliths were brought to the mountain by the leaders of the people of Hida. Generations of such leaders have been buried around these boulders. This accounts for why Kuraiyama is such a sacred mountain. Its shrine is the Minashi Jinja, q.v. 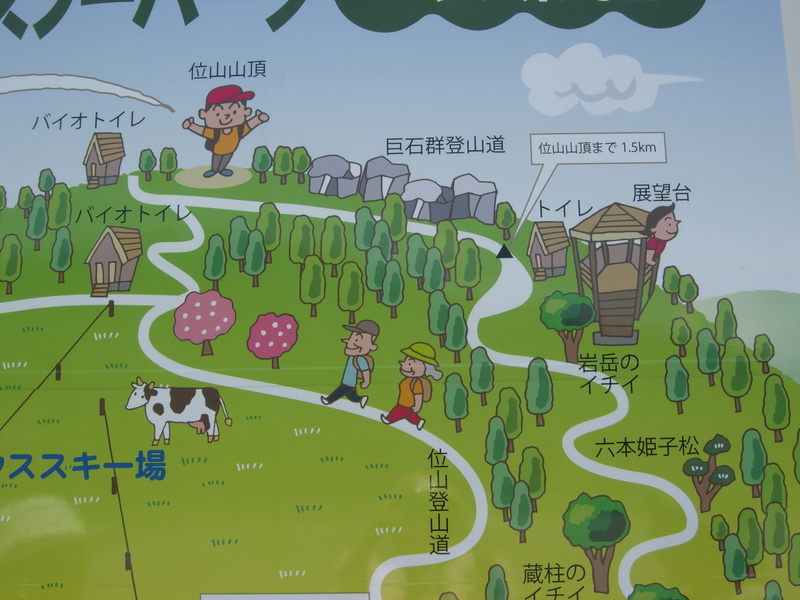 This entry was posted in Hida, pyramids, Takenouchi and tagged Kuraiyama, megaliths on 2013/06/28 by Okunomichi.